It’s a bag . . . it’s a pack . . . it’s a versatile tote. 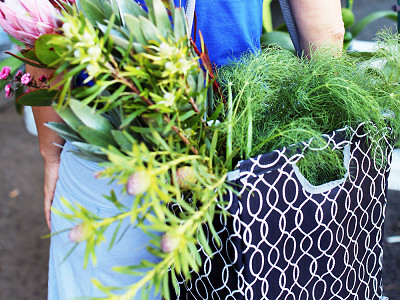 The Packbasket and Market Basket are not your average reusable grocery bags. These carriers are built with lightweight frames that keep your bag structured and also collapse easily for storage. The idea came from Doug Rumbough, who wanted a better alternative to disposable plastic shopping bags and their flimsy reusable substitutes. Doug has visited the Adirondack Mountains his entire life, and he was inspired by traditional Adirondack pack baskets, which are made with woven wood splints and have been used to carry hunting and fishing supplies in the mountainous region of upstate New York since the 1800s. 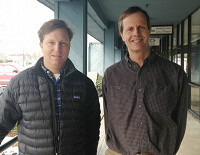 Doug founded ADK Packworks with Scott Hardy, and together they created the Packbasket, which was originally called The Grocer. Their structured bags incorporate framing that provides stability when you’re packing, keeps items in place when you’re on the go, and also folds flat for easy storage. Optional insulated liner keeps your food and drinks cold while you’re on the go, and the backpack system allows you to convert your Packbasket into a functional and comfortable backpack. 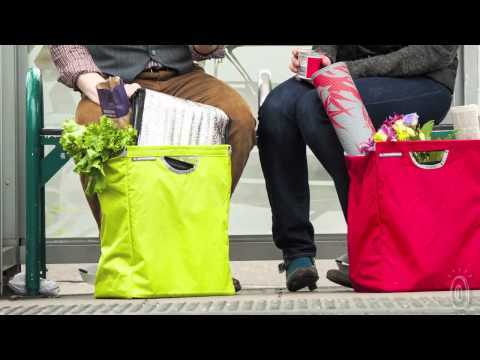 These versatile totes are not just for carrying groceries, but also for hauling beach supplies, packing a picnic, hiking, and toting everyday items to school or work. We’re all trying to break the disposable bag habit, and bans on single-use plastic grocery bags are gaining steam across the country. A durable, more versatile option is just what we need, and ADK Packworks delivers. Hi everyone, We are from beautiful Vergennes Vermont. 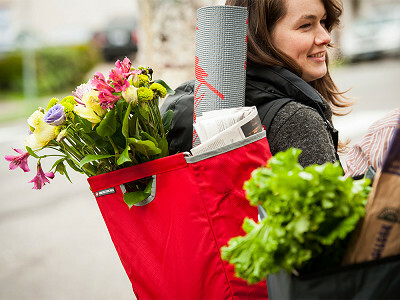 We are excited about The Grommet featuring ADK Packworks' ultimate reusable grocery bag today. When we found out that the United States uses 110 billion plastic and paper bags a year, we decided that we needed to find a more permanent reusable bag solution. And how did we come up with this design, but looking back at a 150 year old pack from the Adirondack Park, and reinventing it for modern times. So let’s chat, and I will tell you the reasons why it will be the best bag you will ever own, and how we were inspired by an iconic product from the past. The ADK grocer seems like a perfect solution for my shopping needs! I can't wait to get one...thanks for launching this cool product! Sounds like a perfect solution as we are continually buying new ones, although we do give the older ones to the food pantry to use when they hand out food. The maximum height in the single loop / messenger / shoulder configuration is 23" from the top of the bag to the to the peak of the strap. The maximum height as a two handle tote configuration is 12" from the top of the bag. Overall the length of the strap is 76". Because we have two slides adjusters on the strap you can make it as small as you need. We spent a lot of time developing our strap system so it will work for all situations. Thanks Doug- I'm waiting back from my husband to hear how many we should buy! I'm sorry to say that it's too bad it's made in China.I know it's all about the cost of making the product. I like the concept and I'm still going to purchase the bag and liner. We're glad you like today's Grommet. In terms of where it's made, we strongly agree with your principles. They are good ones. We always try to partner with those who are able to make their products in the U.S., yet sometimes it's just not possible. We take pride in all of our Grommets being a great product and telling a good story, it's just an added bonus when they're made here in the U.S. I have carried it on airplanes before in the U.S. and there was no problem with security. AMEN!! We need to quit having things made in China! Manufacture these in USA please! I agree. The problem is, people aren't willing to pay prices for items made in the USA. I am manufacturing an item I invented. It will be marketed to elem. teachers and parents. I'm sure they wouldn't be willing to pay more than $20 for item. I searched and searched US manufacturers. My cheapest quote to make the product was $38. Sorry. I had to go overseas. @ Fran K. We hear you. We knew The Grocer was a Grommet in more ways than one. An improved design, a problem solver and an eco-friendly alternative to plastic bags. However, we get that there are many people who prefer to purchase products made domestically. Not every Grommet is for every one. That's why we've made it possible to browse and shop for Grommet by personal values (like Made in the USA). Be sure to check out that section here. We're sure you'll find a Grommet that is a perfect fit. And also, please share with us any new products you discover made in the USA that might make a great Grommet! I was ready to jump on this one - I hate plastic bags. Then I read the details. No way I am buying something made in China if I can help it. @ Tina I'm still going to buy this product, I like the idea of a re-usable grocery bag and not using paper or plastic...it's so much better for the environment. I also like the way it doesn't fall over in my car or on the counter. The grocer looks like it makes a lot of sense. Looks like a great, high quality product to me. I'll be ordering one for sure! I think that the environmental benefits are way more important than where it was made! I am constantly disgusted with the amount of plastic bags I accumulate over short periods of time. Even though I reuse my plastic bags, there shouldn't be that many being made in the first place! Tina...check your house and clothes. Most electronics and apparel you've already bought are made in asia. Why draw the line house at a grocery bag that was created in the usa, creates jobs right here at home and is simply new england ingenuity at its best. I have three! @chuck Hi Chuck. Some of us are realizing that the time has come to speak up. We can and do say it kindly, but finally we are encouraging manufacturers to think a little more about the issue. Hopefully this little exchange will make us all think a bit more about our choices. It ain't much, but it's starting to work among manufacturers that go abroad for cheap labor. It makes them look bad if they aren't at least giving back in some way more than low wage jobs, and coming back here to sell at higher than average prices. It's important to tell the truth. Is it washable? Any other type bag (not plastic) also needs to be washable.....groceries aren't clean, you know. Don't like this not being made in America either.....Americans need jobs -- like my daughter! @ Jeb Little by little people in China and other countries are rising up against the Foreign Corporations who are exploiting them for huge profits. Sorry, Doug...Won't be supporting this wonderful invention. I love it, but will see what I can do with a used baby carrier or back pack frame. Time has come to not add to the abuse of other humans around the world. We need to make a law that if you manufacturers go to other countries to make a living, that you have to create a bigger profit for them by teaching them some new way to improve their lives, like helping them to turn the business into a worker owned business or how to create gardens etc. Oh, yes, I know they know how to farm rice etc, but not everyone makes any money off the rice farming. Probably not even the ones who work them. Just sayin'. Show is what you're doing for them. @ LynnCS Sorry Lynn but a lot of companies are bringing their production back to the US because they are having extensive quality control and production issues in China. One such company is Apple. They have quite a few of their components already being made in the US and are in the process of bringing more back home. The production costs overseas have steadily been increasing over the years and doing so almost exponentially the past couple of years. So, please give Doug a break. He has a good product it looks like and it serves a good purpose. I plan on purchasing one when I get paid. Too pricey. I can get beau coup reusable shopping bags at that price! How many plastic bags did you say are used in the USA each year? I like the idea of cutting down on plastic bags. I would definitely consider your product to be pro-enviromnet. I was shocked when I found out that there are 110 billion bag used annually in this country. Over 800 bags per household. woah..I hope to cut down on my plastic (and paper) bag consumption with the purchase of the ADK grocer. @Doug Rumbough It is a great invention. I would love to see what you are doing in addition to making money (which we all need) with this info by creating a way to getting rid of all those islands of plastic bags and foam packaging that are shown in the overhead shots of the ocean. Maybe you could get together with other packaging companies and create a way by donating a percent or even a half percent of profits to helping the people of the country making these products for you and also to cleaning up the plastic from the ocean. And yes, I realize that by replacing plastic bags with nylon. Which originally was a substitute for silk which was an Asian product. Now we manufacture nylon and use it in Asia to manufacture products with low wage Asian workers. Soon they will realize what we are doing to them and they will rise up. Then we will point the finger at "Them" as lowly, ungrateful people. This is another reason to live a long time. To remember things, and tell it like it is. in Montgomery County Maryland you have to buy bags at stores for 5 cents each.it has made a huge impact here and will probably be expanded to more areas. The green is a fun lime green color. Our plans are to expand our color offerings and bag materials in the future. Thanks for asking. Nice product, steep price. $25 for a bag made in China is way too pricey (even 3 for $68 is far too dear). Admittedly, they are nicer than the cheap reusable totes that every store sells for a buck...but they're not 25 times as nice. I've been using the same 50-cent shopping bags from Wal-Mart for three years now, and they work just fine. 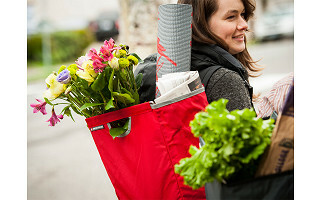 Our bags is very different than the standard reusable grocery bag as it is a 400 denier rip stop nylon and we have an internal folding frame which enables the bag to stand up right and make it easy to load your groceries. The ADK Grocer comes with the bag included but it is easily removable so you could sew your own bag and place it over the frame. I would also love to be able to buy just the frame and make my own nylon bags. Will that be possible? See just above. The frame is sold with the bag, but you can remove if you'd like. I'm impressed with the product and first thought I would be ordering at least 4-6 bags. However, I balked at the price. $25.00 per bag...Sorry. When paper and plastic are still free in the supermarkets, spending $150. to support China manufacturing didn't seem as appealing as the idea. @Thomas Ferrara Please remember you are supporting US companies and citizens. (Both the company that makes the bags and Daily Grommet), if you would be willing to spend the money to support a US company, then you should be spending it to support two US companies and their employees. I will not buy this bag just because it is made in china. China is killing Tibet & it must stop. CAN WE PLEASE USE THIS SPACE AS IT WAS INTENDED, TO DISCUSS THE PRODUCT AND TO GET QUESTIONS ABOUT THE PRODUCT ANSWERED, RATHER THAN RAMBLE AGAIN AND AGAIN ABOUT "MADE IN CHINA"? I am all for buy USA, and I have opinions and a knowledge base on the subject, but this is NOT the place to constantly ramble about it. I'm getting so annoyed with having to sift through the rhetoric to find product answers. Grommet didn't used to always publish where things were made, and I asked them to make that known because it mattered to me. They have both USA and overseas made items, and I am grateful that they publish this now so I can make a fully informed decision where I want to spend my dollars. Quit landblasting them every time they have something not locally sourced, they never claimed to be only USA items, they make it easy to find their only USA items which gratefully they do carry, so take the rhetoric somewhere else that does not do that and leave the rest of us to shop on Grommet in peace!!!!! amen! thank you Emily you are so right. Seriously, I am very annoyed at all of the "made in china" ranting here, I support made in the US products as well but this space is not meant for ranting about where the product is made. Boy, could I get rid of a lot of plastic grocery bags and other totes. I have to tote a portable oxygen tank and I think this would be terrific. It is a very sturdy bag and will hold 30 lbs. and be able to hold your oxygen tank just fine. Make sure you buy one for your groceries as well. This looks like something I'd like but will not buy because it's made in China and is overpriced for what it is. Many newer vehicles have a well that can hold reuseable bags upright so a frame isn't necessary.